On September 30 the NA Standing Committees’ sittings were held. At the sitting of the NA Standing Committee on Foreign Relations, presiding by Armen Roustamyan, the Chairman of the Committee, it was decided to endorse the bill on the draft agenda: “Multilateral Agreement Relating to Route Charges” signed at Brussels on 12 February 1981”, the “EUROCONTROL” International Convention Relating to Co-operation for the Safety of Air Navigation” signed at Brussels on 13 December 1960,” “Additional Protocol to the “EUROCONTROL” International Convention Relating to Co-operation for the Safety of Air Navigation” signed at Brussels on 6 July 1970, “Additional Protocol for the Amendment to the “EUROCONTROL” International Convention Relating to Co-operation for the Safety of Air Navigation of 6 July 1970” signed at Brussels on 21 November 1978, “Protocol Consolidating the “EUROCONTROL” International Convention Relating to Co- operation for the Safety of Air Navigation of 13 December 1960, as Variously Amended”, signed at Brussels on 27 June 1997, “Protocol for the Amendment to the “EUROCONTROL” International Convention Relating to Co-operation for the Safety of Air Navigation dated 13 December 1960” signed at Brussels on 12 December 1981, “Protocol on the Accession of the European Community to the “EUROCONTROL” International Convention Relating to Co-operation for the Safety of Air Navigation of 13 December 1960, as Variously Amended and as Consolidated by the Protocol of 27 June 1997” signed at Brussels on 8 October 2002, which presented Artyom Movsisyan, the head of the Chief Department of the Civil Aviation adjunct to RA Government. Artur Aghabekyan, Deputy Defense Minister, submitted to the discussion of Committee the protocol “On Making Amendments and Additions in the Protocol On the Order of Making Oversight Towards the Purposeful Use of the Product of the Military Importance Supplied Within the Framework of the Agreement on the Main Principles of Military Technical Cooperation Between Participant States of the Collective Security Treaty signed in Moscow on 22 November 2004, and 1954 the Hague Protocol of the Second Convention on the Defense of the Cultural Property During the Armed Conflicts” signed at the Hague on 26 March 1999. The discussed agreements will be submitted to the ratification of parliament with the endorsement of the Committee. During the sitting of the NA Standing Committee on Defense, National Security and Internal Affairs, presided by Mher Shahgeldyan, the Chairman of the Committee, the Committee debated and decided to endorse the government submitted draft law “On Making Addition to the RA law ‘On Protection of the Population in Emergency Situations” in the second reading for being put on the agenda of the upcoming NA four-day sittings, which presented Areg Galstyan, Deputy Minister of Energy. 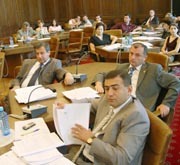 The draft law submitted by MPs Hrayr Karapetyan, Levon Mkrtchyan, Vahan Hovhannisyan, Mher Shahgeldyan, “On Making Amendments and Additions to the RA law ‘On the Citizens Not Passed the Obligatory Military Service by the Violation of the Defined Order,” in the first reading presented to the discussion of Committee Hrayr Karapetyan. The Committee discussed the “Multilateral Agreement Relating to Route Charges” signed at Brussels on 12 February 1981”, the “EUROCONTROL” International Convention Relating to Co- operation for the Safety of Air Navigation” signed at Brussels on 13 December 1960”, “Additional Protocol to the “EUROCONTROL” International Convention Relating to Co-operation for the Safety of Air Navigation” signed at Brussels on 6 July 1970, “Additional Protocol for the Amendment to the “EUROCONTROL” International Convention Relating to Co-operation for the Safety of Air Navigation of 6 July 1970” signed at Brussels on 21November 1978, “Protocol Consolidating the “EUROCONTROL” International Convention Relating to Co- operation for the Safety of Air Navigation of 13 December 1960, as Variously Amended”, signed at Brussels on 27 June 1997, “Protocol for the Amendment to the “EUROCONTROL” International Convention Relating to Co- operation for the Safety of Air Navigation dated 13 December 1960” signed at Brussels on 12 December 1981, “Protocol on the Accession of the European Community to the “EUROCONTROL” International Convention Relating to Co- operation for the Safety of Air Navigation of 13 December 1960, as Variously Amended and as Consolidated by the Protocol of 27 June 1997” signed at Brussels on 8 October 2002, which presented Artyom Movsisyan, Headof the Chief Aviation Department Adjunct to RA Government. Artur Aghabekyan, Deputy Defense Minister submitted to the discussion of Committee the protocol “On Making Amendments and Additions in the Protocol On the Order of Making Oversight Towards the Purposeful Use of the Product of the Military Importance Supplied Within the Framework of the Agreement on the Main Principles of Military Technical Cooperation Between Participant States of the Collective Security Treaty signed in Moscow on 22 November 2004. With the endorsement of the Committee the above-mentioned agreements will be presented to the ratification of the NA. 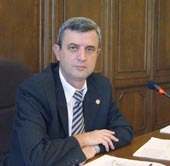 At the NA Standing Committee on Social Affairs, Health Care and Environment, presided by Mnatsakan Petrosyan, the Committee Deputy Chairman, it was decided to endorse the Committee to be presented on the agenda of NA four-day sittings debated in the second reading the draft laws “On Making Amendments and Addenda to the RA Law ‘On Remuneration of Civil Servants’, “On the Social Protection in Case of the Peoples’ Employment and Unemployment”, “On Obligatory Social Security in Case of Temporary Incapability”, “On Making Amendments and Addenda to the RA Civil Code”, “On State Allowances”, “On Social Assistance,” and “RA Forest Code”. The package of the government- submitted bill “On Making Amendment and Addition to the RA Law ‘On Mandatory Insurance Payments’ presented in the first reading Armen Alaverdyan, Deputy Head of the Tax Service. In the package of the bills “On Making Amendment and Addition to the RA Law ‘On Mandatory Insurance Fee” the Committee endorsed the package on the big draft agenda of NA four-day sittings. The proposed amendments “On the Medicine” presented MP Gagik Avetyan. The draft law of RA “On the Medicine” with the endorsement of the Committee was put on the agenda of the four-day sittings. The draft law “On Making Amendment to the RA Law ‘On Great Patriotic War Veterans” presented by Aghvan Vardanyan, RA Minister of Labor and Social Issues. The bill of the draft law “On Making Amendment to the RA Law ‘On Great Patriotic War Veterans” with the endorsement of the Committee was put on the big agenda of the four-day sittings. The Committee also debated the draft law “On Restoration and Guarantees of Legal Protection of RA Citizens’ Savings Deposits,” presented by MP Gagik Avetyan, which with the endorsement of the Committee was put on the big agenda of the four-day sittings. 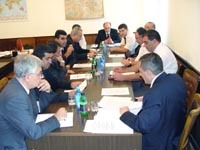 The NA Standing Committee on State and Legal Affairs, presiding by Rafik Petrosyan, the Chairman of the Committee, debated the government-submitted draft law “On Making Amendments and Addenda to the RA Criminal Code”, which presented Karen Matevosyan, Deputy Chairman of the Tax State Committee adjunct to RA Government. Rafik Petrosyan, the Chairman of the NA Standing Committee on State and Legal Affairs, in the adjacent speech highlighted the struggle against the illegitimate goods turnover, underscoring that it should find juridical right wording. The draft law endorsed the Committee’s decision and will be put on the big agenda of NA four-day sittings. Rafik Petrosyan informed that the Committee remarked ten remarks about the draft law, which should be debated in the period of the first to the second reading. The draft, endorsing the Committee’s decision, was put on the agenda of NA four-day sittings. The government- submitted draft law “On Adding the Law ‘On Automobile Roads’ and ‘On Administrative Offences” in the first reading presented Hrant Beglaryan, Deputy Minister of RA Communication and Transport. The draft law with Committee endorsement was put on the big agenda of NA four-day sittings. Grigor Ghongeyan, member of ULP faction, presented in the first reading the draft law “On Making Amendments and Addenda to the RA Law ‘On Regulation of the Rules of Procedure of the National Assembly” submitted by MPs. The draft law with the Committee endorsement will be put on the agenda of NA four-day sittings. Tigran Torosyan, NA Vice President, submitted in the second reading the draft law “On Making Amendments and Addenda ‘On the Order of Conducting Meetings, Rallies, Marches and Demonstrations.’” The draft law with Committee endorsement was put on the draft agenda of NA four-day sittings. Manuk Vardanyan, Chairman of the State Committee of Real Estate Cadastre adjunct to RA Government presented in the second reading the draft laws “On Making Amendments and Addenda to the RA Civil Code,” “On Adding and Amending the RA Land Code”, “On Adding the RA Criminal Code”, “On Making Amendments to the RA Code ‘On Administrative Offences”’, “On Recognizing the Housing Code As Not Being In Effect”, “State Registration of the Rights Towards the Property”, “On Making Amendments to the RA Law ‘On State Duty’”, “On Making Addenda to the RA Law ‘On the Management of Multi-Apartment Building,”“On Making Addenda and Amendments to the RA Law ‘On Service Providing Constraint Execution of the Judicial Acts’”, “On Making Addenda to the RA Law ‘On Licensing’”, “On Making Addition and Amendments to the RA Law ‘On Property Tax’”, “On the Activity of the Estimation of the Real Estate Property.” The draft laws with Committee endorsement will be put on the draft agenda of NA four-day sittings. The drafts laws “On Making Amendments and Addenda to the RA Criminal Code”, “On the Service in RA Courts Staff“, “RA Court Formation,” presented by the Government, were delayed till 30 days, and the draft law, presented by MPs “On Territorial Management,” was delayed till 60 days. The Committee discussed the draft law “On Approving the Report of 2001-2003 Program Execution of the Privatization of the State Property.”The year 2004 also was included in the report. Accodring to the data presented by Karine Kirakosyan, the Head of the Department of the State Property Management adjunct to the Government, during the reporting period the most part of the privatization deals were done by sale and contest. 48 companies included in the program from 69 were privatized by direct sale and 15 – by contest. All the above-mentioned drafts with the endorsement will be put on the draft agenda. With the drafts “On Making Addenda to the RA Law ‘On Mandatory Payments Regulating the Public Services’” and “ On RA Budget System” the Government defines new compulsory payment. The draft with the endorsement will be put on the draft agenda of the four-day sittings. For including into the agenda of the forthcoming sittings the Committee also endorsed other drafts. Among all debated issues the MPs were mostly interested in the draft law presented by the Government, “On Amending the law ‘On Mandatory Insurance Payments”, in particular, the part relating to the amendment of tariffs of social security payments. It is envisaged to do appropriate amendments in 5 laws concerning the sphere. In case of at present acting till 20 thousand drams salary calculated 5000dram social payment, the Government suggested replacing by 7000drams, in other calculations applying this threshold. As Armen Alaverdyan, Deputy Head of the Tax State Service adjunct to RA Government, substantiated, the average level of 2008 salary is envisaged by “Poverty Reduction Strategy Paper” reach up to 14.500 AMD. According to the same program, in 2006 that amount will be 11.720 AMD against today’s 9.888 AMD. IN the republic about 485.000 retired people are registered, and additional 14bn AMD is necessary for the implementation of the program.